Thailand currently ranks on the lowest rung on Southeast Asia's economic growth 'ladder', according to the United Nations. The United Nations Economic Commission for Asia and the Pacific's annual economic and social survey, called "Surging Ahead in Uncertain Times," found that Thailand's GDP grew 5 percent last year, following a 4.5 percent rise in 2005, and is expected to increase just 4.7 percent this year. 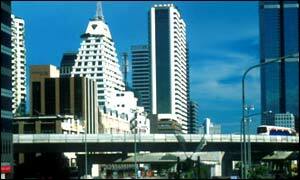 The report also said that GDP growth for the whole of Southeast Asia was 7.9 percent last year. The UN group said Thailand was lagging behind the rest of the region because of hesitancy among foreign investors and ongoing political tensions. On a positive note, Thailand leads much of the Asian region in gender equality. Speaking at a seminar on the Foreign Business Act on Monday, Stephen Frost, a board member of the British Chamber of Commerce, said the controversial proposals have led to negative reactions from existing and prospective foreign investors, and have created confusion and a negative tone toward the Thai government's view of foreign direct investment. ''None of the proposals embraces, enhances or mobilizes the much wider issue of Thailand's leadership position as a substantial trading nation in Southeast Asia," Frost said. "At a time when Thailand's regional competitors are creating a 'can-do' business environment by putting forth clear, attractive ownership structures and tax incentives to encourage foreign investment, Thailand appears to be going in the opposite direction.'' The Joint Foreign Chambers of Commerce is calling for the government to review the 43 categories listed under the FBA, as well as those restricted under separate laws with a consideration for Thailand's global competitiveness.